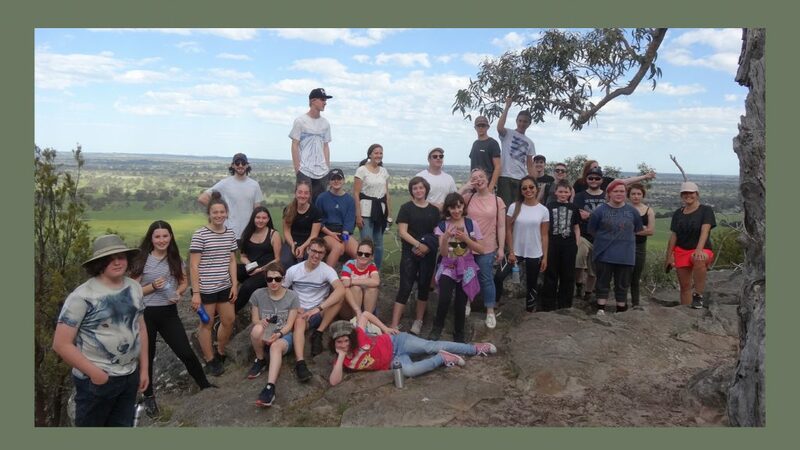 On 22nd October, 25 students and 9 teachers set off to the Grampians Retreat School Camp. Over three days, staff and students took part in activities such as hiking and the giant swing. They worked in teams to overcome challenges such as hut building. We took the bumpy road up to a peak overlooking fields, meadows, the camp, a racetrack and a mountain that looked just like the Devil’s Tower in Wyoming (but with less aliens!). We took an amazing group photo and then trudged back down the hill again. Trivia night included challenges such as moving an Oreo from your forehead to your mouth using only your facial muscles; dipping your nose in Vaseline, sticking cotton buds to it and transferring them from one end of the room to the other; keeping three balloons in the air and wrapping a teammate in toilet paper. We took turns being lifted up to what felt like hundreds of metres into the air by our fellow teammates and teachers. We were then dropped hundreds of metres into the air (I probably should have paid more attention during third grade math), attached to nothing but a fluorescent harness and a few ropes. As you can expect, we scared off the local wildlife with our excessive screams! Our team’s hut looked more like a flimsy Sydney Opera House than a secure hut. However, the next day when we checked on it, a wallaby had set up camp in it; a sure sign that our hut was up to nature’s standards. Having a second camp this year gave students the opportunity to build on friendships they made at Urban Camp and to forge new ones. You can read Miranda’s full camp summary, access photos and the camp video via the gallery on the Student Voice page.